“Influencing the world’s major sheep producing countries”. URUGUAY is a small country of 176,000 square kilometers with a population of 3.4 million people. The climate is mild sub tropical with average temperature of 17.5 degrees centigrade with an annual rainfall of 1250 mm. In the last 20 years there has been an increase of rainfall of 15%. It is a country where its landscape is composed of soft rolling hills and the highest point is 514 meters above sea level. sector. 95% of the territory is useful for agriculture with approximately 80% of the soil used for cattle and sheep,10% for crops and 10% for forestry. Wool was the primary export for almost all of the last century and only at the end of that period was it surpassed by beef cattle (15%), soybeans (14%), dairy products (8%), cellulose (7%) and rice (5%). Today wool and wool products represent 3% of the country’s exports and sheep meat less than 1%. Historically sheep culture has been of fundamental importance in the development of the economy and farmers in the country. heads of sheep. A 1 to 1 ratio would provide a higher income and more stability of the systems of livestock production with the prices we actually have for these products. Gabriel Capurro at La Pastoral Merino Dohne Stud, Uruguay with his 2017 sale rams. HISTORICALLY the distribution of the sheep population by breed in Uruguay, has been 61% Corriedale, 21% Merino, 10% Polwarth, and 8% other breeds. As a consequence of the price differences between fine and medium wool in the last clips, Corriedale is currently 45%, Merino 28%, Polwarth 10% and others breeds 17%. in producing high value wool the reproduction and growth indexes determine a limited production of meat. The target for sheep breeders is to improve the income of the flock, producing more meat and wool of high value with a low cost sheep, rustic and easy to care. Merino Dohne is the best option and that is why it was introduced in Uruguay in 2002. 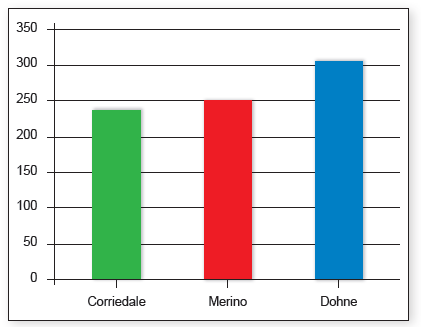 With prices today for wool and sheep meat and the average technical coefficients for the different breeds in our country, Dohne has the highest gross margin per stock unit, (1 stock unit = 6 breeding ewes). Dohne gross margin is actually 56% from meat and 44% from wool. Figure 1: Gross Margin different breeds US$/stock unit. scientists and researchers of the National Research Institute (INIA), the Uruguayan Wool Secretariat (SUL), and the University of Agriculture. With the support of the result of these trials, the breed has been growing constantly since the introduction in our country. For the last four years, the Dohne annual ram sales has sold with the best average prices, and the last year equalled the number of sires sold by Merino Breed. Attendees at the 2017 La Pastoral Merino Dohne Stud Annual Sale, Uruguay. extended to all the delegates at the Global Conference 2016 in Australia.